The website is designed to lead dentists through this new technology. We start by explaining how ozone works and it’s general application in society. 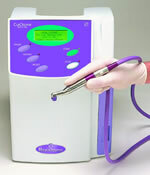 Healozone® uses this technology in the treatment of Dental Disease. Healozone® is not just a treatment modality but encompasses a new concept in minimally invasive dentistry. It redefines our approach and treatment of Dental decay. Research Data shows that this technology is producing exciting results. We have also included articles on interest and a links page for further information. Please contact us with any information, tips ideas and queries that you might have. This site is for you. Dental Marketing & Dentist Websites by Dental Focus Web Design.